Historic Downtown Burlington lists the local independent businesses in Downtown Burlington, Wisconsin. The owner wanted to create an online visitors guide. They had a shopper's map that listed all of the shops and places to eat. An online visitors guide would let people know what Historic Downtown Burlington Wisconsin had to offer and encourage them to visit. I started by researching local downtown websites. From this research, I learned what types of information that they provide. Next, I created a list of information that the new website should have. I created a sitemap to organize the types of information into pages. Then, I sketched out the pages. I showed my ideas to the owner and we finalize the site structure. The owner wanted a retro, historic design to emphasize the history of the downtown area. I researched retro or historic design. Retro design uses dark, muted colors like the dark red and muted green. It also uses old-style and script fonts and paper-inspired backgrounds. I added these elements into the overall design. To add a historic feel, I chose a script and old-style type font. They are used in the logo and the navigation bar. We chose dark red, green and yellow for the main website colors. The logo uses a script and old-style font plus historic decorative embellishements. Using the original shopper's map, I created custom post types to organize the shops, restaurants and places to visit. To highlight the personality of each shop, I chose to photograph either the front of the building or their sign. We included a page on the history of Burlington. 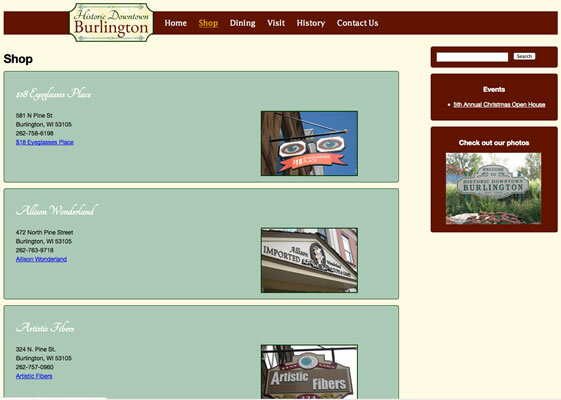 For the home page, I worked with the owner to create a short description of Burlington. I built the site in WordPress. Using an HTML5 starter theme, I created a custom theme. This theme uses the elements of retro design. Then, I created custom post types to organize the different business. I created three types: Shops, Dining and Places to Visit. WordPress lets you create a gallery of photos. I created a gallery to let visits see parks, architecture and other unique things about Burlington Wisconsin. When the website was first built, we had a small selection of stores. Other businesses in the downtown area asked to be on the website. The website helps to let people know what the downtown has to offer. Historic Downtown Burlington is no longer available online.